When this young family moved into their ranch style home years ago, an outdated kitchen was their first order of business but eventually the need for family space became a priority. The Living Room, as the first space visible upon entering the home, presented a challenge. My approach was to begin by creating a floor plan to utilize the long narrow room to meet their lifestyle needs and then choose furnishings and finishes that were beautiful but also family friendly and practical. Separating the space into the more adult area and a family TV viewing space was important. My clients also wanted to create a clean bright color palette with a nautical feeling to reflect their proximity to the ocean. 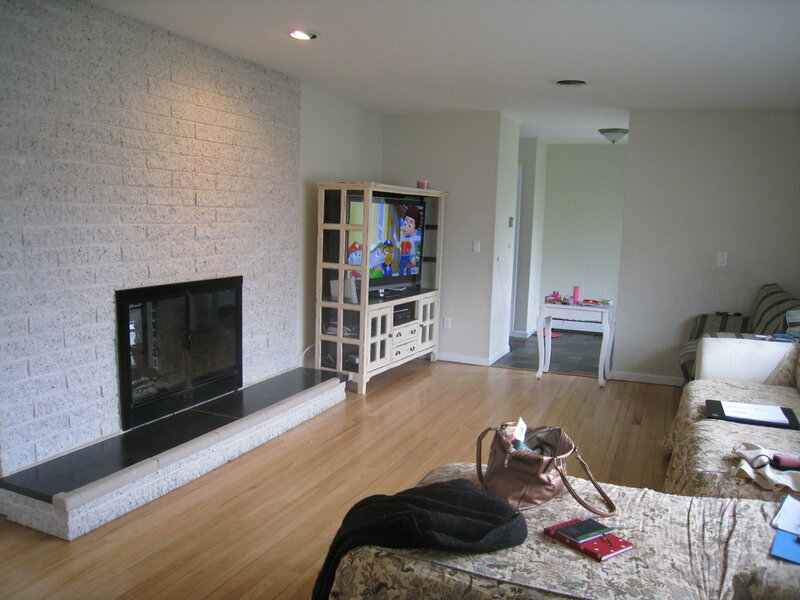 Positioning the adult friendly area first allows us to use the stone fireplace as a focal point. A bright red area rug anchoring two navy and white striped love seats and matching floor lamps placed perpendicular to the fireplace allowed for an intimate conversational grouping as well as plenty of pass through space for comfortable traffic flow. 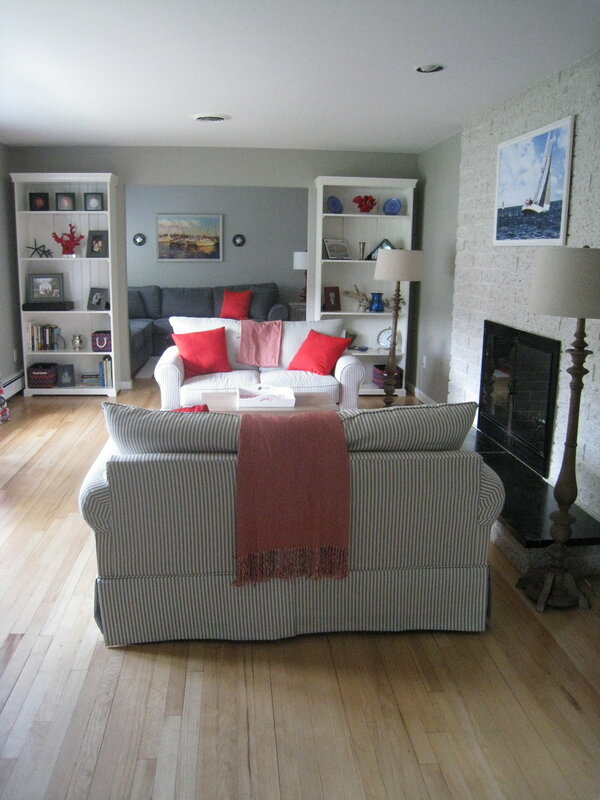 We chose a warm grey for the wall color and pops of navy, bright red and blue for our accents. White washed wood cocktail and console tables are scaled perfectly for the space. Red leather cubes tucked away add to flexible seating as does the additional chairs by the corner writing desk and in the entry hall. A custom cellular shade from Designers Resource provides privacy at night and a pair of custom drapery panels in a contemporary Ikat print frames the front window with color. Artwork in several mediums walks color around the space and extends into the Entry for a unified effect. A red lantern and brightly painted wooden sailboat model in front of the window adds sculptural interest and can be seen from the outside as well. Two white bookcases used for the narrow walls flanking the Family Room display memorabilia and treasures from the sea. These were installed directly to the walls for improved stability and safety. By positioning a large sectional sofa covered in durable blue/grey micro suede in the back room we were able to create a cozy family space. A large square leather ottoman invites you to put your feet up for watching TV, reading and playing games. The corner TV stand hides electronics and insures everyone a good seat for viewing. Pillows, art and an area rug extend our accent colors throughout the space for a balanced and harmonizing effect. This bright and chic take on the nautical theme is fresh and current. Whether entertaining large groups or just relaxing together this family now has a space that truly reflects who they are and how they like to live their lives. Casual and kid friendly fabrics in a bright and classic color palette give the space a happy and timeless feel. Custom window treatments give privacy and light control as well as adding pattern and texture to the space.